This small Dometic refrigerator is common in small trailers, slide-in truck campers, and various pop-ups. It has a large food storage compartment that is completely closed and unventilated, which is necessary to maintain the required low temperature for food storage. 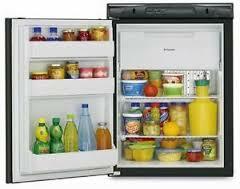 A frozen food storage compartment is included with the 3.0 Cubic Foot Refrigerator. This refrigerator operates on LP Gas and 110V AC. It does not operate on 12V DC, however it still requires a 12V connection to run the controls. If 12V isn't connected the controls won't light up. What does this refrigerator replace? RM4290, RM4292, RM36, RM360, RM361, RM2300, RM2301, RM2310, RM2332, RM2333, RM45, RM46, RM47. Keep in mind that the dimensions might be different from your old refrigerator. If this is the case, then some cabinet modifications may be necessary. 30-5/32 H x 21-7/8W x 22-23/32 D"
If this is a new installation, you will need to order a door panel, otherwise you should be able to use the door panel from your old refrigerator. Keep in mind, if you don't install a door panel, the foil insulation will be showing on the face of the door.